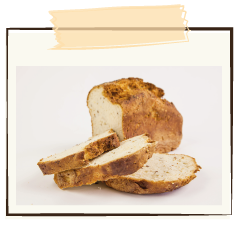 The same dough mix as our plain bread, enriched with sunflower seeds, linseeds, buckwheat, millet and poppy seeds. Wheat free, gluten free, dairy free, egg free, nut free and yeast free. 1 * 1,000g loaf per package. Rice flour, potato starch, soy flour, tapioca starch, sunflower seed, buckwheat, millet, linseed, soy lecithin, canola oil, glucono delta-lactone (575), poppy seeds, xanthan gum (415), guar gum (412), salt, water added.